On Saturday 13th May the Community Centre Trust will be holding an Spring Coffee Morning between 10am-12pm at the Old School on Charter Lane. There will be tea, coffee, cakes & a raffle. So why not bring your family for a drink & meet up with friends. All proceeds raised will go towards the restoration of the Old School. In addition, if anyone can volunteer their time or donate prizes for the event it would be greatly appreciated. Please email margaretstewart@btconnect.com if you can help in any way. 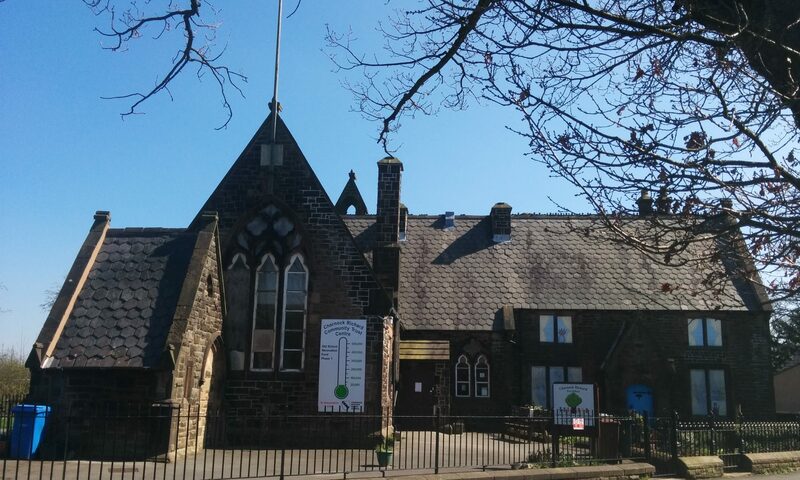 On Saturday 8th April the Community Centre Trust will be holding an Easter Coffee Morning between 10am-12pm at the Old School on Charter Lane. There will be tea, coffee, cakes & a raffle. So why not bring your family for a drink & meet up with friends. On Saturday 18th March the Community Centre Trust will be holding a Mother’s Day Coffee Morning between 10am-12pm at the Old School on Charter Lane. There will be tea, coffee, cakes & a raffle. So why not bring your Mum or children for a drink & meet up with friends. On Saturday 11th February the Community Centre Trust will be holding a Winter Warmer Coffee Morning between 10am-12pm at the Old School on Charter Lane. There will be tea, coffee, cakes & a raffle. So why not pop down for 5 minutes for a drink & a catch up. On Saturday 21st January the Community Centre Trust will be holding a Winter Warmer Coffee Morning between 10am-12pm at the Old School on Charter Lane. There will be tea, coffee, cakes & a raffle. So why not pop down for 5 minutes for a drink & a catch up. On Saturday 10th December the Community Centre Trust will be holding a Christmas Coffee Morning between 10am-12pm at the Old School on Charter Lane. There will be tea, coffee, mince pies & a raffle. So why not pop down for 5 minutes for a drink & a catch up. In addition, if anyone can volunteer their time or donate prizes for the event it would be greatly appreciated. Please email margaretstewart@btconnect.com if you can help in any way. As many of you will have heard the trustees were unsuccessful in their bid for funding in their first round application to the Heritage Lottery Fund. The trustees were bitterly disappointed but, as we were all aware, demand for funds from Heritage Lottery means they cannot support every good application that meets their criteria, therefore our project was rejected due to insufficient funds. The North West Committee recognised the strong community support here in Charnock Richard and the commitment to the project. However, it was felt that due to the high cost of the capital works the project did not offer good value for money or represent the same level of urgency when compared with other applications which were presented for decision. The Grants Officer informed us she would be happy to discuss our proposals with us, but, in any re-application they will need to see that the project will offer improved value for money, either through a reduced grant request for the same or similar project, or increased benefits for a similar grant request. They expect to continue to receive more good applications than they can support, and any re-application will be subject to the same competitive assessment process as new applications in both assessment rounds. Two representatives from the Heritage Lottery Fund came to Charnock Richard to meet us in February. We showed them around the Old School and the Old School House and then we had a meeting along with our consultant, Nigel Rix, and our architect, Peter Hatfield. We were told our project had been recommended to receive a grant offer, but unfortunately their funds were insufficient. Somehow we have to make our project stand out from the rest of the applications. After the representatives from Heritage Lottery left our meeting we discussed the way forward. It was suggested we could cut back on our project by eliminating the proposed extension. The trustees were not happy with this proposal as it would reduce the flexibility of community facilities which are crucial to the viability of the project. The preferred option is to reduce our grant request from Heritage Lottery Fund by approximately £100,000. £50,000 would have to be funded by other means – by making grant requests to other bodies, by fundraising, by donations etc. etc. We would also take out of the project, initially, work on the outbuilding, the boundaries and other less critical areas to achieve a cost saving of a further £50,000. At a meeting held last week the trustees have agreed to submit a new application for funding from Heritage Lottery by the end of May for the North West Committee’s September meeting. They have also decided to submit an application to Awards for All for a specific capital scheme which would comprise the installation of pre-school toilets into the kitchen area of the Old School House. If this project was successful, it would reduce the cost of the main project. Informing people about our heritage is vital to our application and, with this in mind, we have organised one or two activities. On Sunday 28th April 2013 we are holding a Parish Lunch in the Scout and Guide Headquarters. In addition to all our regular people, we would like people to attend who will share their memories of life in Charnock Richard many years ago. We want to know about life at School, Sunday School, Church, about occupations, about social life. We want to hear your memories. If you are willing to attend and share your memories please contact myself or any of the trustees. On Thursday, 18th July 2013, John Armstrong of the Milestone Society, will give a presentation at the Football Club at 7.30pm on “The Travails of the Haigh Casting Mileposts.” He will tell us about the old Wigan to Preston turnpike and the chequered history of its Haigh foundry cast iron mileposts, including the recently restored Charnock Richard milepost. Finally, Mrs. Janet Ogden, who has served our committee faithfully for a good number of years, has decided to resign. Janet has worked very hard particularly at the time of the Scarecrow Festival when she organised the Grand Draw. We would like to thank Janet for her dedication and commitment. This does mean we now have a vacancy on our Trust. If you are interested in joining us to push this project forward, please contact us. In the meantime, I can assure you the trustees are determined their project will succeed. These grade II listed buildings need to be preserved, restored sympathetically, and, adapted to meet the needs of our community for this generation and future generations.